Am 14. September 2016 veröffentlichet die ESA erste Daten, die mit dem Gaia-Astrometrie-Satelliten erstellt wurden. Dazu gab es auch ein beeindruckendes Foto des Nachthimmels mit der Milchstraße, dass aus mehr als 1 Mrd. Sterne besteht. 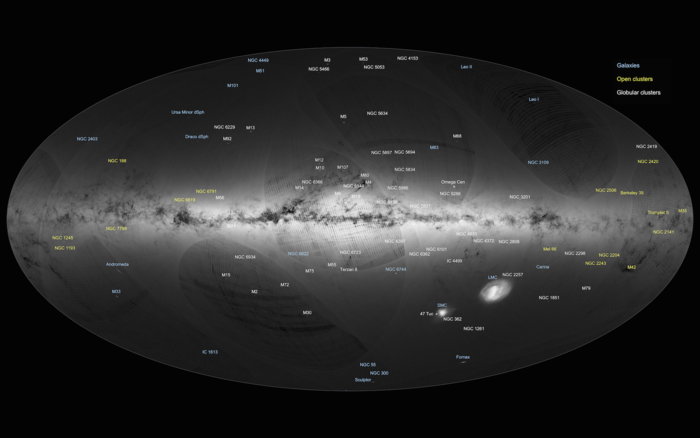 Zitat: An all-sky view of stars in our Galaxy – the Milky Way – and neighbouring galaxies, based on the first year of observations from ESA’s Gaia satellite, from July 2014 to September 2015. The Milky Way is a spiral galaxy, with most of its stars residing in a disc about 100 000 light-years across and about 1000 light-years thick. This structure is visible in the sky as the Galactic Plane – the brightest portion of this image –which runs horizontally and is especially bright at the centre. Darker regions across the Galactic Plane correspond to dense clouds of interstellar gas and dust that absorb starlight along the line of sight. Many globular and open clusters – groupings of stars held together by their mutual gravity – are also sprinkled across the image. Globular clusters, large assemblies of hundreds of thousands to millions of old stars, are mainly found in the halo of the Milky Way, a roughly spherical structure with a radius of about 100 000 light-years, and so are visible across the image. Open clusters are smaller assemblies of hundreds to thousands of stars and are found mainly in the Galactic Plane. The two bright objects in the lower right of the image are the Large and Small Magellanic Clouds, two dwarf galaxies orbiting the Milky Way. Other nearby galaxies are also visible, most notably Andromeda (also known as M31), the largest galactic neighbour to the Milky Way, in the lower left of the image. Below Andromeda is its satellite, the Triangulum galaxy (M33). A number of artefacts are also visible on the image. These curved features and darker stripes are not of astronomical origin but rather reflect Gaia’s scanning procedure. As this map is based on observations performed during the mission’s first year, the survey is not yet uniform across the sky. These artefacts will gradually disappear as more data are gathered during the five-year mission. hierzu findet sich ein sehr lesenswerter Artikel von Ulrich Bastian (Vorstand des Gaia Konsortium) und Stefan Jordan (Öffentlichkeitsarbeit des Konsortiums) in der SuW 10/2016. Wie ich eben erfahren habe wird Prof. Dr. Eva Grebel (Astronomisches Recheninstitut, ZAH Heidelberg) zum Thema: „Das neue Bild der Galaxis" auch bezüglich der Gaia Daten ein Vortrag halten. (Bundesweite Lehrerfortbildung Heidelberg/MPI Astronomie Königstuhl am 11.11.2016) In der Regel komme ich an die Handouts bzw. PP Präsentationen ran. Sollte das der Fall sein, werde ich diese hier bereit stellen. Auf diese Präsentaton bin ich echt gespannt. Erfahrung und Mut zur Lücke! (26.09.2016, 20:38)klingonio schrieb: Wie ich eben erfahren habe wird Prof. Dr. Eva Grebel (Astronomisches Recheninstitut, ZAH Heidelberg) zum Thema: „Das neue Bild der Galaxis" auch bezüglich der Gaia Daten ein Vortrag halten. (Bundesweite Lehrerfortbildung Heidelberg/MPI Astronomie Königstuhl am 11.11.2016) In der Regel komme ich an die Handouts bzw. PP Präsentationen ran. Sollte das der Fall sein, werde ich diese hier bereit stellen. Gibt es schon eine 3D Darstellung der Daten? Bei 1% der Sterne unserer Galaxis in der Datenbasis müsste sich ja schon in gewissermaßen sehr genau die Struktur unserer Galaxis errechnen lassen.